Briana is one of the great women I am going to have the privilege to spend time with in a little over a week. I am so looking forward to BlogHer (more coming soon on my decision to attend) in Chicago. Head on over to Bargain Briana for a few of my suggestions, to read my great post, and to see what bargains she is talking about today. Check it out I am guest posting over at Keeping it “Cent”sible! Blog Talk Radio Recording Now Available! 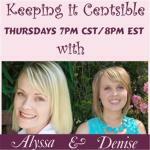 If you missed the Keeping It Centsible Blog Radio Show (shame on you) you can still hear the great stuff that was shared. Come on in and find out how!